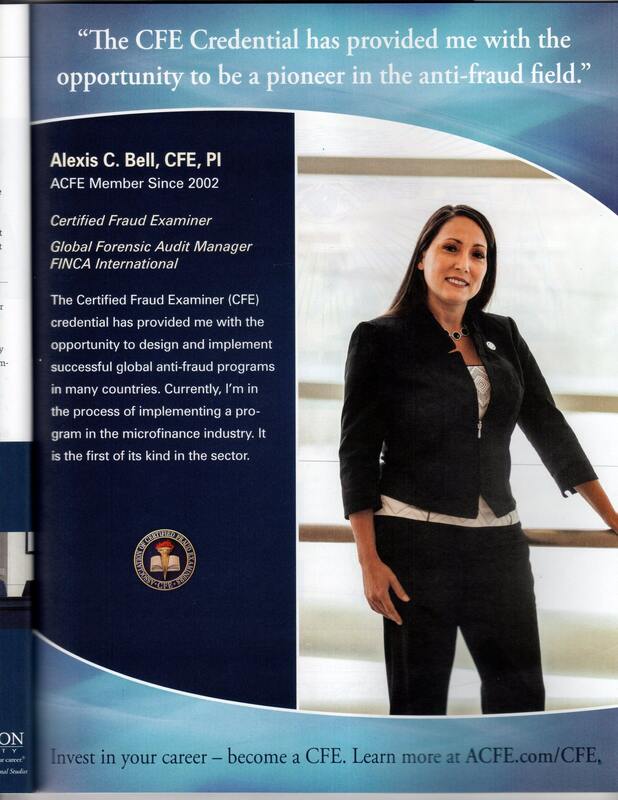 Alexis C. Bell, MS, CFE, PI is the founder & managing partner of Fraud Doctor LLC. She helps companies protect themselves from fraud to reduce risk, educate, and through outreach. She is driven by the fact that every asset lost due to fraud is one less resource that could be used to achieve objectives. 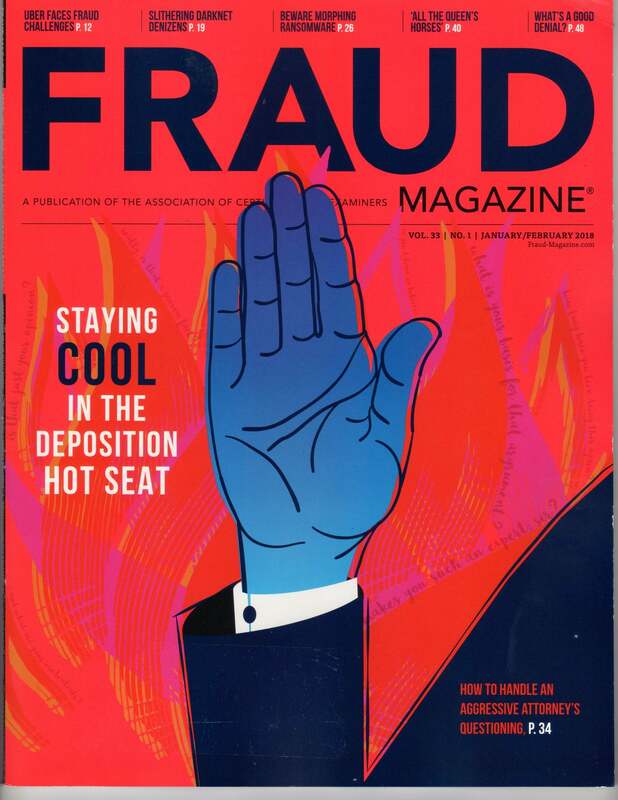 The ultimate goal is to protect organizations from fraud and assure funds can remain within (prevention) or return to (response) the organization for the original intended purpose of accomplishing the mission. Bell is a graduate of Cornell University with a BS in Applied Economics, completed the ASCENT fellowship at Dartmouth University, and obtained her MS in Financial Crime and Compliance Management at Utica College. She has authored three books and broken new ground with academic research in furtherance of the antifraud field. In addition, Bell serves as an adjunct professor in the Financial Crime & Compliance Management (FCM) graduate program in the College of Business & Justice Studies at Utica College. Bell successfully led the design and implementation of the initial Global Antifraud Program for a European public conglomerate with 165,000 employees. She then pioneered the first comprehensive Microfinance fraud risk management program covering 22 post/active conflict developing countries in the Greater Middle East, Eurasia, Latin America, and Africa. Both initiatives encompassed governance, fraud awareness training, fraud risk assessments, data analysis, investigations, and communication strategies. Bell is the elected Global Chair Emeritus to the Board of Regents for the Association of Certified Fraud Examiners (ACFE) and appointed board member for the LexisNexis Fraud Defense Network Advisory Board. She is a champion within antifraud communities speaking at conferences & delivering specialized training. 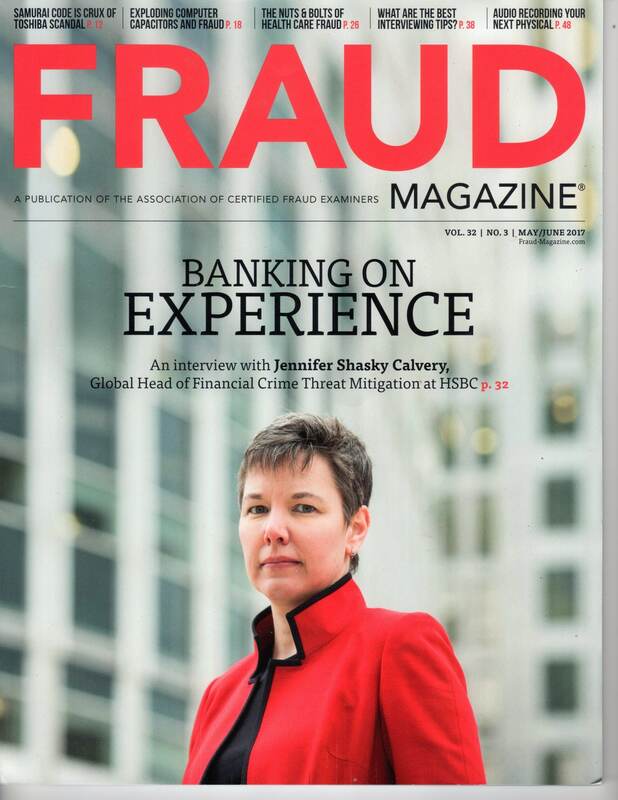 She also produces a video podcast series (FraudCast) connecting antifraud thought leaders to global followers. 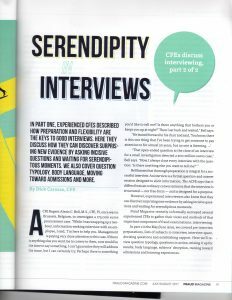 Bell spearheaded and chaired internal diversity programs addressing employee education and community outreach regarding both women's and Native American initiatives. She has been an active member serving on internal diversity & inclusion boards as well as external nonprofit boards supporting both antifraud and the arts. 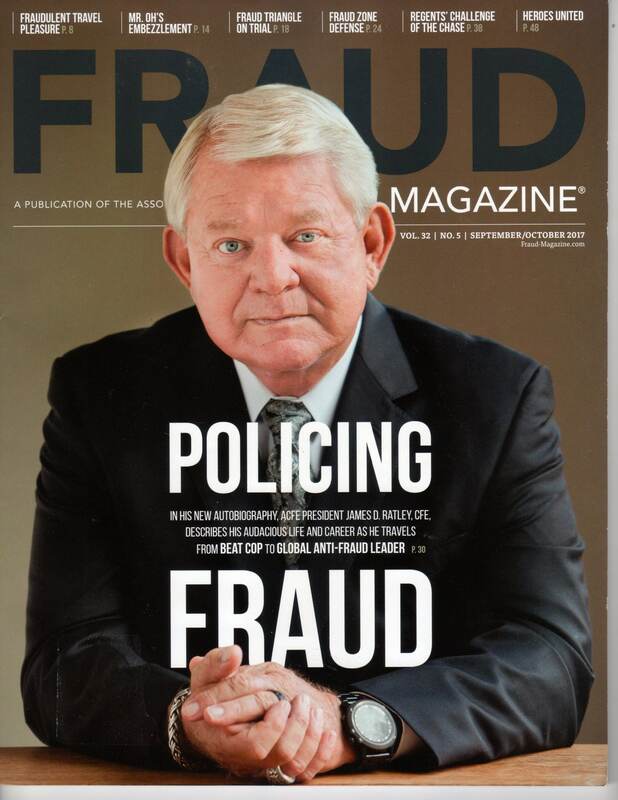 I help companies protect themselves from fraud by specializing in international litigation support, antifraud consulting, training, and board advisory. I am driven by the fact that every dollar lost due to fraud is one less dollar that could be used to help someone in need (e.g. shareholders, other stakeholders, NGO clients, etc.). The ultimate goal is to protect organizations from fraud and assure funds can remain within (prevention) or return to (recovery) the organization which are then used for the original intended purpose of accomplishing their mission. I am a graduate of Cornell University with a BS in Applied Economics, completed the ASCENT fellowship at Dartmouth University, and obtained my MS in Financial Crime and Compliance Management at Utica College. I have authored three books and broken new ground with academic research in furtherance of the antifraud field. 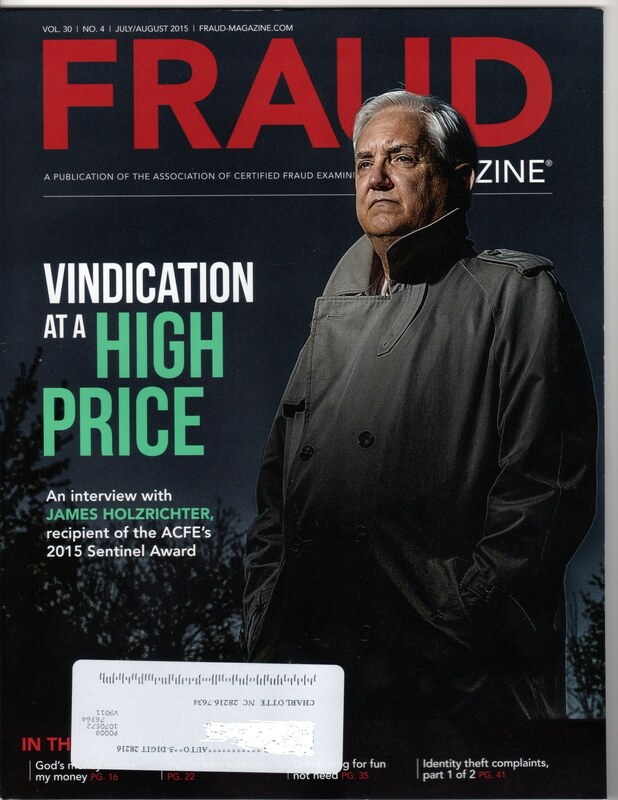 I successfully led the design and implementation of the initial Global Antifraud Program for a European public conglomerate with 165,000 employees. I then pioneered the first comprehensive Microfinance fraud risk management program covering 22 post/active conflict developing countries in the Greater Middle East, Eurasia, Latin America, and Africa. Both initiatives encompassed governance, fraud awareness training, fraud risk assessments, data analysis, investigations, and communication strategies. 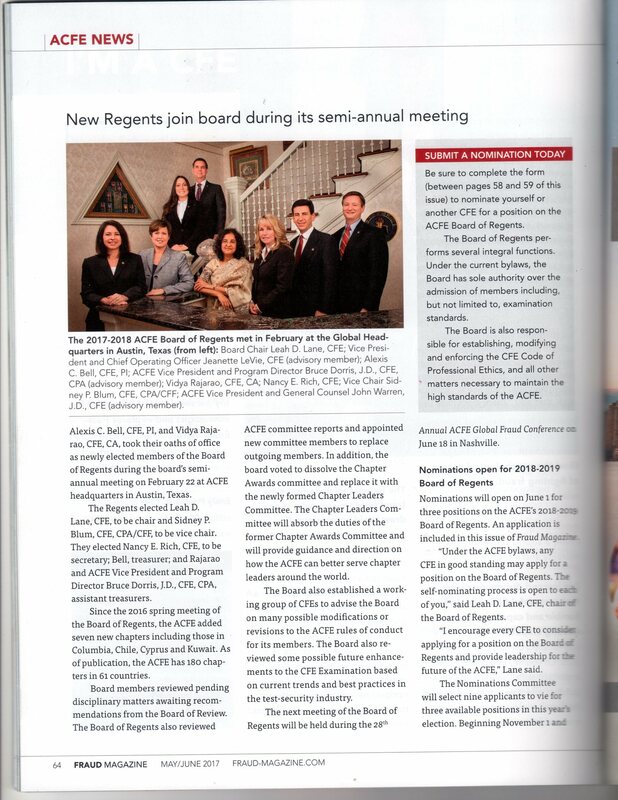 I am a current elected member to the international Board of Regents for the Association of Certified Fraud Examiners (ACFE) and appointed board member for the LexisNexis Fraud Defense Network Advisory Board. 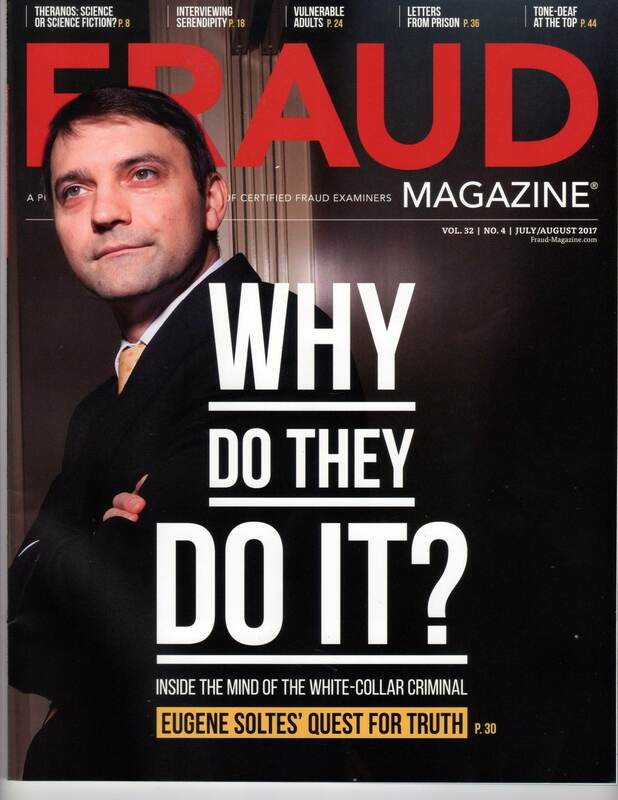 I am a champion in antifraud communities speaking at conferences & delivering specialized training. 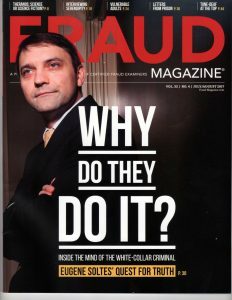 I also produce a video podcast series (FraudCast) connecting antifraud thought leaders to global followers. Alexis C. Bell, MS, CFE, PI is the CEO and founder of Fraud Doctor LLC specializing in litigation support, antifraud consulting, training, and board advisory. She is a graduate of Cornell University with a BS in Applied Economics, completed the ASCENT fellowship at Dartmouth University, and obtained her MS in Financial Crime and Compliance Management at Utica College. Bell has authored three books and broken new ground with academic research in furtherance of the antifraud field. Bell successfully led the design and implementation of the initial Global Antifraud Program for a European public conglomerate. She then pioneered the first comprehensive Microfinance fraud risk management program covering 22 post/active conflict developing countries in the Greater Middle East, Eurasia, Latin America, and Africa. Both initiatives encompassed governance, fraud awareness training, fraud risk assessments, data analysis, investigations, and communication strategies. Bell is a current elected member to the international Board of Regents for the Association of Certified Fraud Examiners (ACFE). 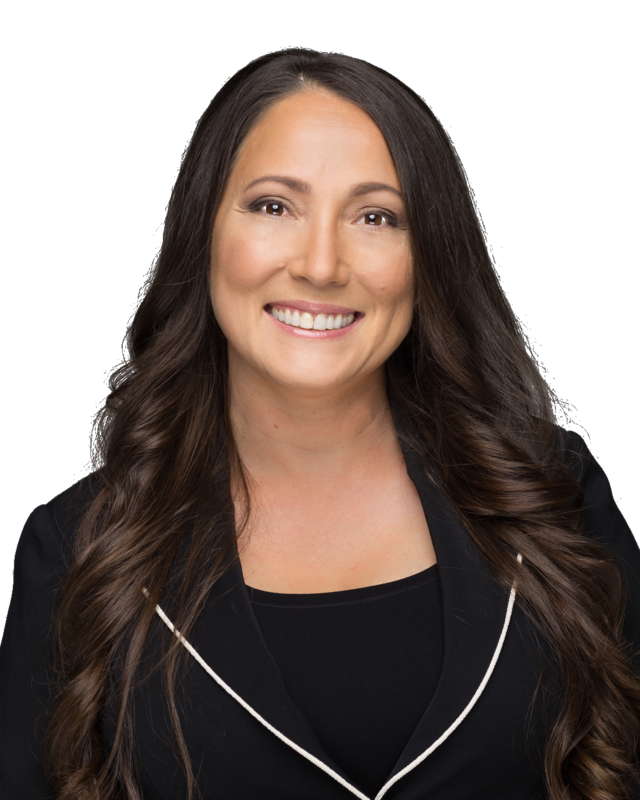 She continues to be an influential champion in the domestic and international antifraud communities speaking at conferences and delivering specialized training. She also produces a video podcast series (FraudCast) connecting antifraud thought leaders to thousands of global followers. Specializing in international litigation support, antifraud consulting, training, and board advisory. 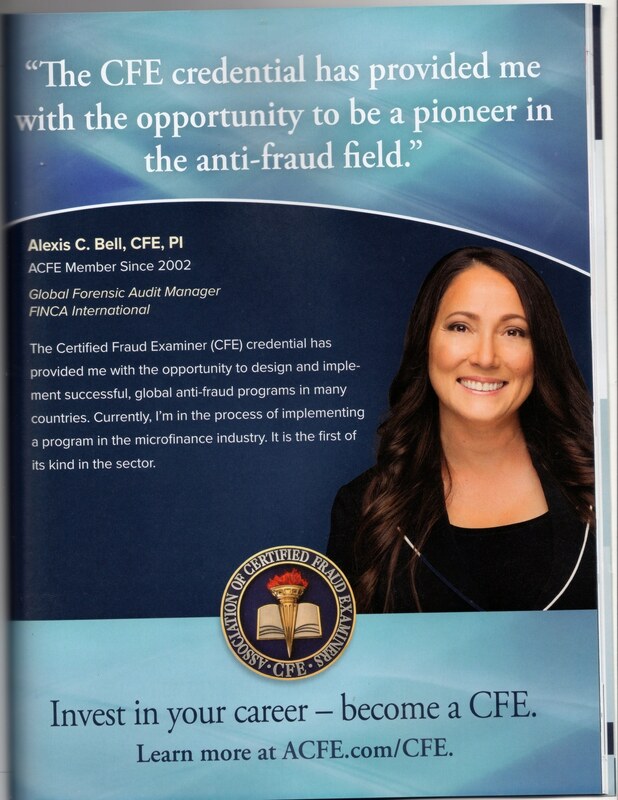 Alexis C. Bell, MS, CFE, PI is a pioneer in the international Antifraud industry. She helps companies address their fraud management concerns by designing a brand new program or assessing and enhancing their existing antifraud structure. 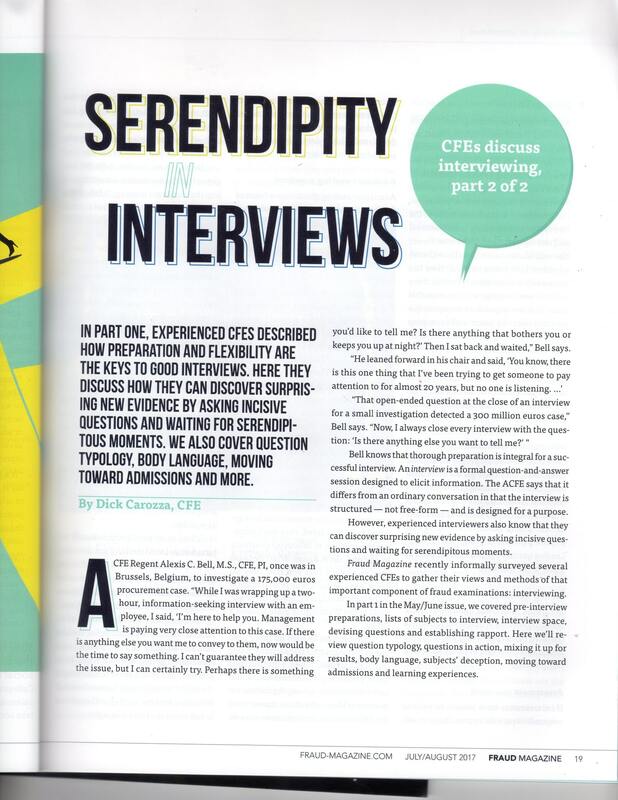 She is passionate about her work and engages others to align with the company’s vision. She is a published author with an Ivy League education (undergrad at Cornell University and fellowship at Dartmouth). She has international experience as a forensic accountant leading complex corporate fraud investigations (up to 300M Euros) specializing in insider threats. She has also led projects in data analysis particularly around financial statement analysis and transaction level data. Alexis designed and implemented the Global Antifraud Program from the ground up for a public conglomerate ($19B annual revenue, 165,000 employees). The program addressed areas of governance, fraud risk assessment, fraud awareness training, investigations and continuous monitoring. She is energized by solving complex problems. 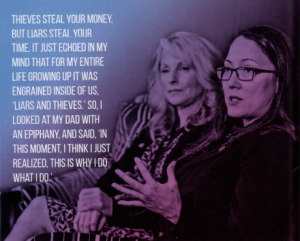 Most recently, she pioneered the first Global Antifraud Program in the Microfinance industry (nonprofit) in 22 post/active conflict developing countries in the Greater Middle East, Eurasia, Latin America, and Africa. She is active in the Antifraud community as an elected board member of the Association of Certified Fraud Examiners (ACFE) Board of Regents, current member & former Board President of the Charlotte Chapter ACFE, member of the U.S. FBI InfraGard task force and former member of the U.S. Secret Service Electronic Crimes Task Force in Charlotte, NC. In addition, she lectures at conferences and provides specialized training both domestically and internationally. Alexis spearheaded and chaired internal diversity programs addressing employee education and community outreach regarding both women’s and Native American initiatives. She has been an active member serving on internal diversity & inclusion boards as well as external nonprofit boards supporting both antifraud & the arts.